What a beautiful month, the month of February is. A month dedicated to the season of true love. The best part about Valentines Day is that it is a grand finale for all those days dedicated to the purpose of love & caring. It is actually a fortnight suitable to be adorned with Valentine serenades. Valentine party hamper includes:DAY-1:Five stems of orchids arrange in a bunch with green fillers wi.. It is a love overdose for all the three days for your valentine. Give the love of your life somethin..
Day 1. Bunch of 12 Red Roses + Valentine message card Day 2. Bunch of 6 Roses + 1/2 kg chocolat.. Surprise your loved one for 3 days in a row with our special rose serenade. Wrapped vibrantly in the.. Your gift contains Day 1: Bunch of 12 pink roses, 2 cadbury silk chocolates and 6 inches teddy bearD..
Showcase your love with hints of colorful hues with specially curated FlowerAura 4 day serenades! 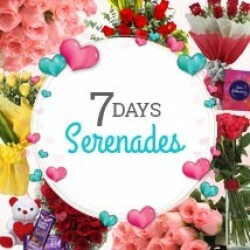 Th..
Pamper your sweetheart with this straight-from-the-heart 3-Day Serenade product, it consists of: 12t.. Your Gift contains: Day 1: Bunch of 10 red roses and greeting card.Day 2: Bunch of 12 mix color rose..
Day 1 - Bunch of 12 White Roses Day 2 - Bunch of 12 Yellow Roses Day 3 - Bu..
Love is in the air! Make sure you put your best foot forward in surprising your Valentine. Nothing c..
Start your Valentine's Day by sending flowers of different colors, they symbolize the course of your..
Love is sweet and let the sweetness be felt this Valentine's day. Let your Valentine feel that you l.. Surprise them on the lovely week of love with hints of natural beauty wrapped elegantly and a teddy ..